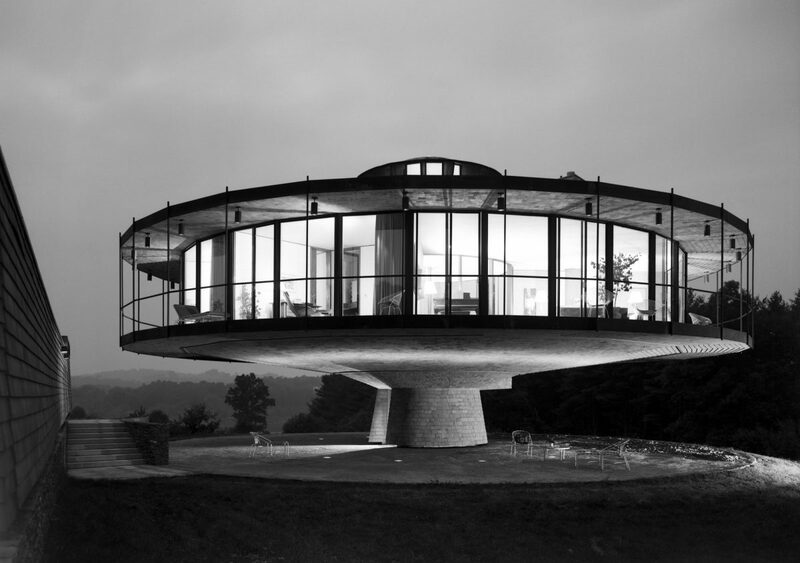 “Circambulant” is the term renowned architect Richard Foster coined to define the characteristics of the revolutionary residence he designed for himself and his family. And revolutionary it literally is,. for the entire house can rotate to change the view at will, or to follow—or elude—the sun. Built on a serene hillside site that commands sweeping views of a pine forest, lakes, a pond, and fertile farmlands bordered: by typical Connecticut stone walls, Mr. Foster, when pluming his dream house, was hard pressed to decide which view he liked the most and so decided to build a house that could rotate so that he could enjoy them all! A technical tour-de-force and an historical first, the house is driven—silently and imperceptibly—by the same type of drive mechanism used to rotate a naval gun turret; it has extraordinary capabilities. To arise at 7:30 A.M., for example, one simply sets the controls so that at the appointed time the bedroom windows are facing due east to the rising sun! At sunrise and sunset can be admired from the same room. There are other benefits, not immediately apparent; during the summer months the house can be rotated at just the right speed so that the living room, dining room, and . study are always on the shady side, while in the wintertime, fuel bills may be minimized by setting the house to rotating once every 48 minutes so that every room is warmed by the sun throughout the day. So carefully designed and precisely constructed is the drive system, that only a 1.5 h.p. motor—which uses no more current than a refrigerator—is needed to move the 250-ton residence. The technical aspects of the house—though impressive—are completely unobtrusive. The motion of the house is imperceptible;. even the control panel is concealed. It is a completely workable, thoroughly livable home, albeit a highly dramatic one. With a diameter of 72 feet, the house has 2900 sq. ft. of living space. In addition a six-foot-wide deck—used almost constantly year-round—completely en-circles the house, providing another 1400 sq. ft. of space. The entrance is across a spacious open court-yard of Italian cobblestones to the pedestal, into a small foyer and a spiral staircase of 12 steps ascending to the living floor. Fabulous light, air and space greet the visitor in the central hall, which rises 30 feet to a skylighted cupola and opens to all rooms. A feeling of spaciousness is all-pervasive. The outer walls of all seven rooms are floor-to-ceiling glass, each alternate panel a sliding door. The living room has a 48-foot outer wall of glass, and a handsome fire-place of steel aged to a cinnamon brown which needs no maintenance. Nor does the floor of warmly glow-ing glazed tiles which need no waxing, a floor treatment used in all rooms. Across the entry hall, a short passage with concealed laundry and utility rooms opens to the dining room and the kitchen, efficiently equipped and large enough for a breakfast area. The master suite has a large dressing room with a marble-topped vanity and a private bath. Two bed-rooms share a large dressing room and a two-compartment bath which has a fully tiled spiral shower stall. The den, opening from a foyer with closet and powder room, can serve as a guest room. The main house is complemented by a satellite building built into the hillside. The upper level is a two-car garage, while the lower is a guest room/play-room measuring 20 ft. by 30 ft. with a half bath. It is heated, has sliding glass doors leading to a terrace, and could serve as a full apartment. The house abounds in innovative and luxurious de-tails. Clothes racks that pull out from the wall and rotate, for seasonal wardrobes. Floor-to-ceiling concealed storage for shoes, shirts, and personal linens. Maintenance-free Corten steel is used for the deck railing and supports. Lights embedded in the court-yard flood the shingled underside. Paintings and sculptures are pooled in light from ceiling spotlights. A number of walls are carpeted, to absorb sound and to facilitate changes in paintings without leaving marks. Handsome American oak is used for the many contemporary built-ins. And there is an elaborate fire and burglar alarm system. Of note for family use: despite its secluded setting, the property is conveniently close to Wilton’s shops, NewYork City commuter trains, and excellent schools. All-in-all, a highly refined, ingeniously conceived, beautifully detailed “machine for living”; stunning even when standing still.